At Jodenbreestraat 4 near the Waterlooplein, you’ll find the house that Rembrandt lived and painted in for 20 years. Inside, you see all the main rooms including his studio and it’s well worth a visit. The house doubled up as both a living space and a business place for Rembrandt. Visitors would enter through the main door and paintings hung all around the room. Clients would then be shown into the Anteroom where more paintings hung and they could choose which they liked. He didn’t only sell his own paintings either, so works by other artists would have hung on these walls. Upstairs you’ll find another important part of Rembrandt’s business, where the room with the best light was used as his studio. The interior of the house was restored in 1999 to the way it used to be in the 17th century. Rembrandt got himself in to a lot of debt when he bought the house and it’s only because he declared himself bankrupt in 1656 that full lists were made of his furniture and belongings. These were then auctioned off, but the records have enabled the house to be restored to how it looked in Rembrandt’s day. We loved the house and we thought it was a fascinating insight into the man and the way that he lived. If you haven’t got time to go inside, you can see the outside of the house on the Amsterdam Walking Tour which has great reviews from travellers who’ve been it. 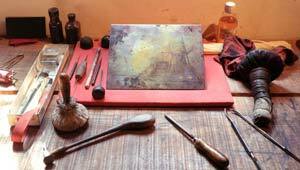 Rembrandt House is open daily from 10am to 5pm. Adult admission is 12.50 Euros although the Iamsterdam Card brings the price down to 2.50 Euros (2011 prices). Prices include the audio guide.